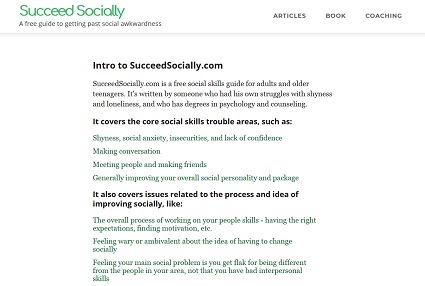 This site outlines some core principles for building a social life. One way people can have trouble getting those strategies to work for them is when they live in a city or country where it's harder to form friendships. I can't list all of them, but a few cities that have this reputation are Seattle, Minneapolis, New York City, and Los Angeles. When it comes to countries, the Scandinavian ones are mentioned the most - Norway, Sweden, Finland, and Denmark. Germany comes up too, though not quite as much. It has a culture where strangers aren't as social with each other. When people are out in public they keep to themselves. Making friendly chit chat at the bus stop isn't really done. 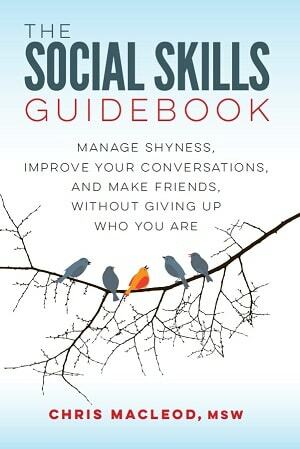 Even in more socializing-focused situations, like parties, people aren't as keen on making small talk with someone they don't know. It has a culture where people are friendly and polite on the surface, but it's difficult to move the relationship beyond that level and become real friends with them. Someone will happily chat to you at the office or on your volleyball team, but if you try to get them to hang out later they'll be next to impossible to pin down. It has a more reserved, private, less-social culture on the whole. It's not that every last person is an aloof hermit, or that there are no bubbly, outgoing types, just that on average people aren't as chatty and open. Being reserved and being shy aren't the same thing, but a reserved culture can reinforce people's existing shyness, because they're not forced to practice as much. The Scandinavian countries are often described as being this way. It has a culture where people keep their heads down and mind their own business. Often this is because the population is dense, and everyone has to act this way to give each other privacy. Unfortunately, the mentality can go too far and create situations where people don't even know their neighbors. New York City is a common example. Many of the people in the area have long-standing social circles and aren't looking for new friends. They'll happily chat to their co-worker who's just moved to town, and have nothing against them, but also aren't interested in fitting a new person into their calendar. They may unconsciously assume everyone else has a circle of friends they met in elementary school, and not get what it's like to be new to a city and not have anyone to hang out with. This has been given as one reason it's tricky to make friends in Minneapolis. A lot of people are moving to the area, and the locals aren't that enthusiastic about befriending them. In really touristy cities the locals may be reluctant to be friends with tourists because they know they'll leave after a few months. In other cities the long-time residents may feel they don't have much in common with the new arrivals. The area has a culture where friendships develop slowly, but once they've formed they're very deep and loyal. They think people from other places use the word "friend" too loosely. What an outsider may call a friend, they'd call a friendly acquaintance. Newcomers who are used to making five new "friends" within a week of joining a club may feel like no one likes them, when everyone is really just taking their time. The Scandinavian countries are also said to be like this. The area has a higher-proportion of people with lower social needs. That is they're happy to hang out with friends once or twice a week, but feel drained if they do any more. That can create behavior where someone will cheerfully talk to you when they run into you day to day, but they won't want to get together. They've already rationed out their limited social energy to their current buddies. Not that it excuses flakiness, but a lower social drive can even lead to making plans, then cancelling - They were up to it at first, but after a few days felt they didn't have the energy. There's a theory that part of the reason it's hard to make friends in Seattle is because a lot of tech industry workers live there, and on average they want more alone time. (It's a stereotype, but the average tech worker may also be more shy, and more likely to do things like agree to meet up, then chicken out later). The area has a "phony", self-interested, networking-focused culture, where people will act friendly and outgoing because they're trying to meet someone who can boost their career. Once they decide you can't help them they won't want anything to do with you, but also don't want to burn their bridges, and so will string you along with empty promises to hang out sometime. People often complain Los Angeles is like this, because half the city is trying to make it in the entertainment industry. The area has a really ambitious, work-focused culture, where many people are too busy to make time for new friends. New York City is an example here too. The lousy weather, which turns everyone into mopey homebodies. The bad transportation system, which makes people lazy about setting up plans that involve too much traveling. A car-focused culture, where everyone moves from place to place in their own bubble. A tendency for people to settle down and start families early in life, and lose interest in going out with anyone new. However, there are plenty of cities with iffy weather or lots of young families or so on which don't have unfriendly reputations. In the end no one fully knows why any city or country has its particular social culture. Every place where it's hard to make friends has its own idiosyncrasies and challenges, but here are some general suggestions that should help in any of them. None of them are quick and easy answers, but will still hopefully make putting together your social life a little less painful. Yeah, that means on top of other things that may slow the process down, like being out of school. Also realize it's not a reflection on you if your social life doesn't fall into place after a month. Even if you do everything right, it may still take you longer than you'd like to find some good friends. Be patient when people don't open up and want to be buddies as fast as you're used to. Even in locations where it's trickier to make friends, many people do have fulfilling social lives. While it may legitimately be harder to form a social circle, keep in mind it can be done. It's trite to say, but if you keep at it you'll make it work eventually. If you give up and stop trying, then you're guaranteed not to meet anyone. One benefit of not giving up and keeping yourself out there is that it gives you at least some human contact, which can help tide you over until you have deeper relationships. For example, if you go to a local board game night at a hobby shop once a week, you'll still get to chat to some people. That's not as good as having a close group of friends you can see on the weekends, but it's better than being on your own all the time. Remind yourself that's just how the local culture is. If people aren't talkative with strangers, or hard to make plans with, or slow to accept new people into their social circles, it's not that they're all meanspirited jerks who hate you. They're only acting in a way that's natural to them. Every aspect of a culture has benefits and drawbacks. Rather than reflexively seeing the area's practices as bad, try to appreciate its good sides. What are the pros of people being reserved around strangers, or building their friendships more carefully? Sometimes people move to a city and are initially put off by the social customs, but eventually realize they prefer them. For example, at first they disliked how strangers didn't talk to each other, but came to appreciate that when they go out in public they can be certain they'll be left alone to do their own thing. Until they experienced the alternative, they may never have realized how tiring they found it to be expected to make polite small talk with everyone. Or they may like knowing that while it takes longer to become friends with someone, once the relationship has formed it will be solid. If you're in an area where strangers don't talk to each other in public, then don't do it and meet people in other ways. That one's not a big loss, as chatting to strangers is far from the best way to make friends. However, beginners can mistakenly focus on it. Technically there may a way you could beat the system and meet people in public anyway, but that's likely more trouble than it's worth. Whether the culture is less social with strangers, or friendly but hard to get closer to, this is a solution to both issues. You need to meet people in situations where you can keep seeing them and really get to know them. If you can naturally do this through your school, living, or work situation, that's great. Otherwise look for things like ongoing social clubs, hobby classes, sports teams, or volunteer positions. If you meet someone you like who you know you probably won't see again, you can still invite them out of course. Just accept the odds they'll be say 'yes' are lower. Your old friend-making strategies may have involved waiting for other people to make the first move, or quickly letting someone know you were open to hanging out, then letting them take the lead. Realize you'll have to take more initiative now. Be a little more pleasantly pushy, rather than tossing out a vague suggestion and hoping for them to take the ball. E.g., instead of going, "We should hang out sometime", say, "This Saturday afternoon let's go see a movie then grab a bite to eat after. What do you think?" No matter what approach you use, you'll still get some rejections, but at least this way you're taking your social life into your hands. The locals may be reluctant to become friends with you, but new arrivals will be way more open to the idea. Try to find social events that cater to people who are new in town. You're much more likely to quickly form a social circle with them. If you come across a newcomer in your day to day life, know they're probably more eager to make friends. This advice is often given about Los Angeles, where the out-of-towners can be too mercenary and career-focused, while the locals are said to be more down to earth and open to hanging out without an agenda. Some cities know they have a reputation for being tough to make friends in, and people will organize events with that in mind. For example, Seattle and Minneapolis have held get togethers where people who want to make friends can meet up. For example, you may have moved to an area where a lot of people are outdoorsy, or like to socialize at pubs, or volunteer a lot. If you can get involved in these activities you'll have an easier time meeting people. For example, maybe everyone is into hiking. You never did it much in your old city, but have nothing against it, and are willing to give it a shot. Naturally, getting into the local hobbies won't always be an option. There are some things you may never be interested in, no matter how practical it would be. However, if you think you could manage to get involved with a popular local pastime, then give it a shot. For example, it's said that the usually-reserved people in Scandinavian countries become a lot more chatty and outgoing when they've had a few drinks. Some will even joke that getting buzzed is the only way they can loosen up and talk to each other. Is it the most healthy social custom? Nope. Is it news you want to hear if you're not a drinker? Nope, again. But it's still information you can work with. Like you may decide to try to go to more parties. Even if you don't drink much at them yourself, you may still be able to make some social connections that you can parlay into non-drinking-focused hang outs. They may not realize what they're doing wrong, and be easier to deal with once you point it out. This isn't an option you should try with everyone, but may pay off in select cases where you have a feeling it'll work. If you do it, bring up the issue in a friendly, casual way. Don't act too angry or offended or whiny, or imply their culture is flawed, and they should change to suit your style. For example, you may say to a co-worker, "Hey, we've known each other for months now, and eat lunch together every day, and obviously get along. Do you realize when I've asked you to hang out in the past you've automatically made an excuse without even thinking about it? What would be so bad about us hanging out outside of work?" I've read accounts by people who said they became much happier after finally throwing in the towel and moving out of the city where they couldn't make any friends. They said they instantly felt more at home once they were living somewhere where people actually chatted to each other in the park, or had no problem going out for drinks with someone they'd just met. Not everyone clicks with every culture. Like I said, some people will move to a supposedly less-friendly area and realize they prefer that way of doing things. Others will feel like they're swimming upstream for a few years before accepting the local customs aren't for them and moving on.